Maria James was murdered in her residence at the back of her second-hand bookshop in Melbourne, Australia, in 1980: Tuesday, the 17th of June around noon to be exact. She had been stabbed 68 times with a knife from her own kitchen. Her murder has shocked and puzzled Melbourne for 37 years and counting. Still counting because, officially, the case remains unsolved. However, in a recent media investigation by the Australian Broadcasting Commission (ABC) investigative journalist, Rachael Brown, evidence has been presented, including new evidence, which points convincingly to the resolution of this long standing mystery. Before we get any further into this article, a few notes regarding sources, credits and responsibilities. This article and others that will follow in this series were compiled with the invaluable assistance of a fellow blogger here at Winter Patriot Community, McJ. McJ has sourced most of the photographs and most of the documents (yet to be published) and has been of great help regarding ideas and reasoning. However, all writing and publishing decisions are my responsibility entirely. All material published here has been published previously and available on the web and/or can be reasonably and logically assumed from the published material. If a source is not cited, you need only ask and this will be provided. While I am personally in possession of information that has not been published anywhere, none of it has been used and will not be used in future unless it is specifically identified and a source cited (with their permission, of course). At the link below, you, the reader, will find all the information you need to solve this case. There are five audio presentations and five articles which accompanied the release of each audio episode over the last few weeks. There is also a sixth article, an epilogue, Trace: what happens next at the link. It's an intriguing case, to be sure, and it is very engagingly presented. Everything has been done very professionally leaving only the final 'dot-joining' for you, dear reader, to bring this saga to a close. A close, that is, unless of course you want to do some more dot-joining afterwards as to why it has taken police 37 years to not solve this brutal murder. And why and how Victoria Police hijacked the investigation by the ABC in the last audio episode with their story at the last minute of the "Bungled DNA Evidence". But, for now, that is another saga! Will you take up the challenge that has befuddled, and continues to intrigue, the population of Melbourne, Australia, and has been Australia's most popular podcast for weeks now? The investigation standard is simple truth using simple logic and not legal procedure which too often has no need for truth or logic. This is not a court case nor a prosecution brief but simply a search for the truth and for an answer for Mark and Adam James, Maria's sons. A short ABC television report was done three years ago which is useful as an overview. Pay particular attention to Fr Anthony Bongiorno's responses to questions from the reporter and Mark James' description of Bongiorno's manner when informing him of his mother's death. There are pictures, diagrams and maps after the jump which will be helpful in reconstructing the scene. Maria's bedroom, where her body was found, is the (only) bedroom to the right of the central passage. The large room marked "living" nearest the street at the bottom of the diagram was the bookshop at the time of the murder. The door between the shop/living room and the passageway into the residence had a glass panel and a covering curtain over the glass. The french doors opening from the now 'living' room onto a walkway and the gate from the walkway to the street were not there when it was a shop. The front door opened directly from the shop/living onto the street. The "Decking" at the rear of the shop was not there either. 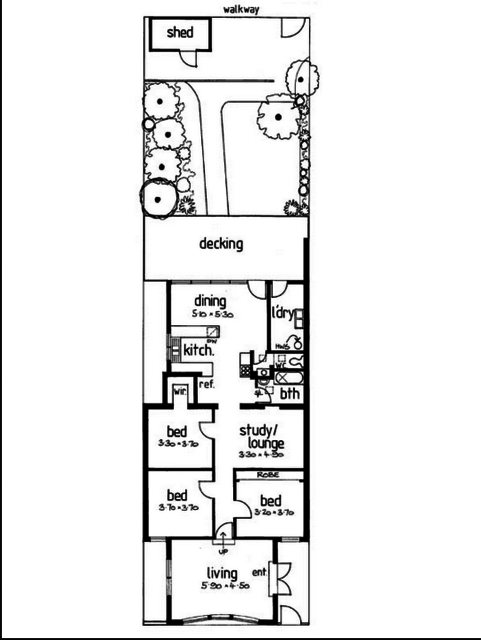 Otherwise, I am reliably informed, the layout of rooms is as it was at the time of the murder. Maria's shop can be seen as '736' in the map facing High St. North is to the top of the map. Hutton St. is opposite to the West. The walkway is to the East directly behind the shop and St Mary's is to the South as is 'the city'. 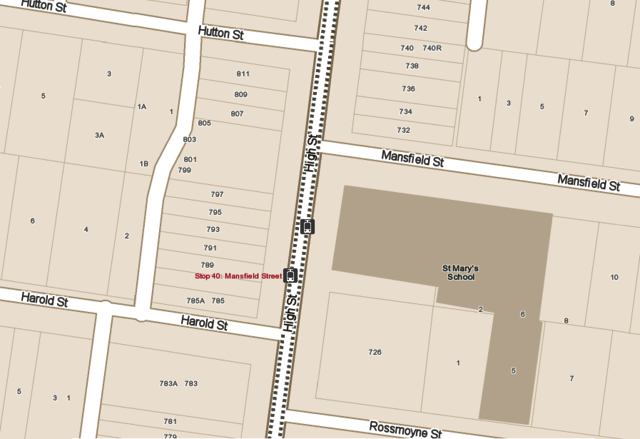 The street map shows the walkway at the rear of the shop (736 High St.) leading onto Mansfield St with St Mary's School and Presbytery across Mansfield St. and bounded by High St and Rossmoyne St. There is a gap between the buildings of St Mary's directly opposite the walkway that runs behind the shops and opens out onto Mansfield St. This gap between the buildings is not shown on the map. The map presents the property as one large building but, in fact, it is several buildings and there were large gaps between them in 1980. The plot "726" represents St Mary's Church and the plot marked "1" is the presbytery or Manse. The drawing immediately below is a map sourced from the ABC website and was drawn recently by Allan Hircoe whom you will meet in Trace episode 2 and also in the following instalment by your writer here. 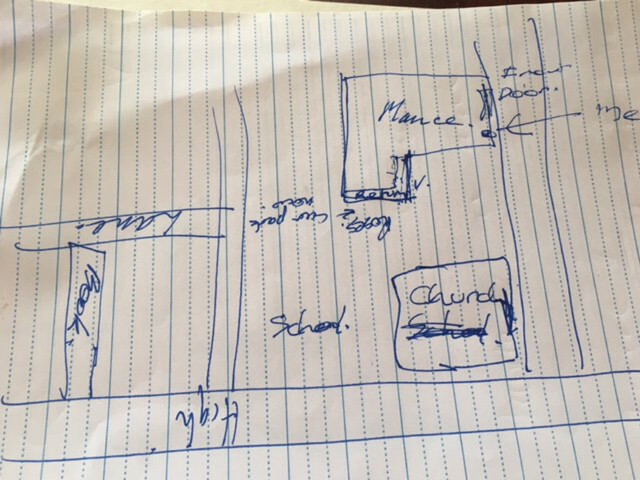 This was drawn from his memory of how the buildings were at the time of the murder. More buildings and additions have been constructed since then. "North" is to the left of the drawing. 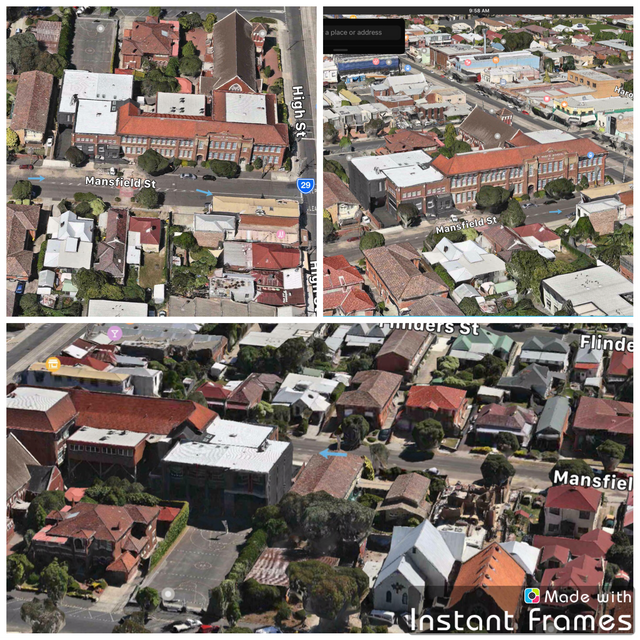 And "Mance" is 'Anglican-speak' for "Presbytery"
The top left pic (taken in 1980) shows the bookshop on the left (clipped) taken from across High St. Next to it are the two adjoining shops then a gap which is Mansfield St and then the red brick building which is St Mary's school on the opposite corner of Mansfield St and High St. The top right pic is again taken from across High St with the bookshop on the far left of the picture (clipped) and showing the view down Mansfield St. 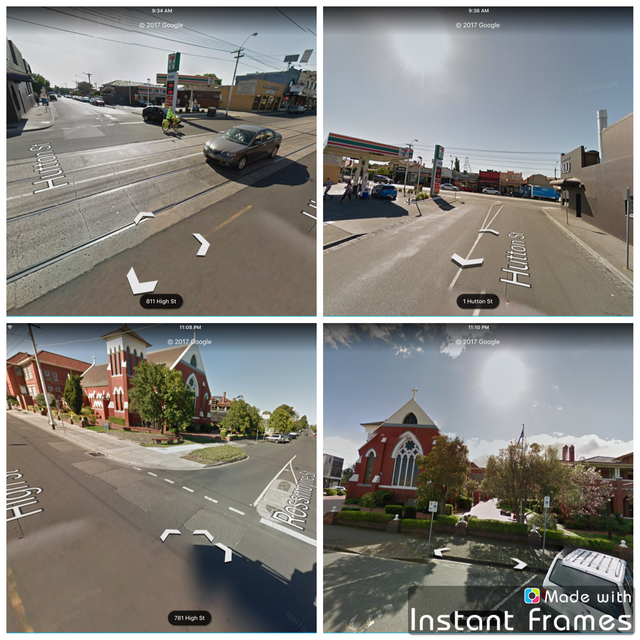 The bottom left picture shows Mansfield St. There is a high metal fence on the left which is the far wall of the walkway that runs behind the shops including Maria's bookshop. There is a man sitting down on a low foundation wall that constitutes the near boundary wall of the walkway. The walkway is quite narrow. 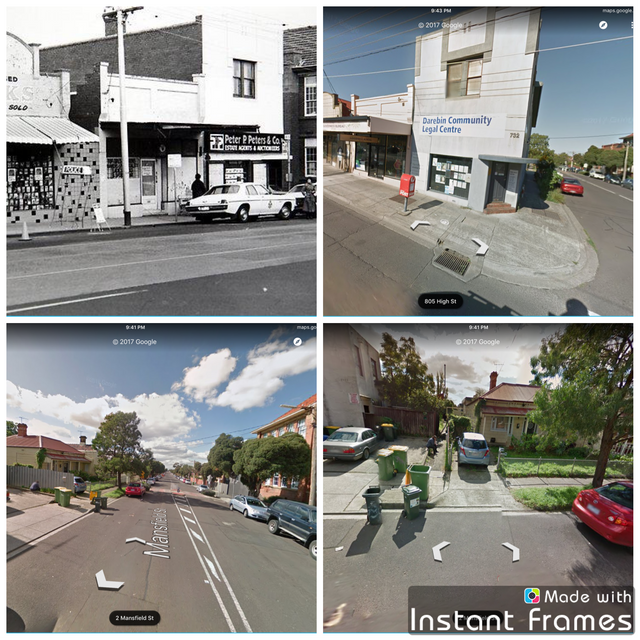 The bottom Right picture is taken from across Mansfield St looking down the walkway in a northerly direction. You can see the same man sitting on the low wall mentioned before. The school is directly behind the photographer. The top left pic is taken roughly outside the bookshop and looking across High St to the west down Hutton St. The top right pic is taken from down Hutton street looking east back at the bookshop. The bookshop is behind the blue parked truck. The bottom left pic shows St Mary's church looking northwards at the other side of the school and the bookshop further up the High St out of sight. The presbytery can be seen to the right of the church and facing onto Rossmoyne St. Bongiorno would have come from behind this building and around to the front on Rossmoyne St. The bottom right pic is looking directly across Rossmoyne St with the church on the left and the presbytery on the right. There is quite a gap between these buildings. The top left picture is an aerial view looking south (and towards the city). Maria's shop can be seen as the third roof from Mansfield St on the far left. The walkway is visible as a dark line. 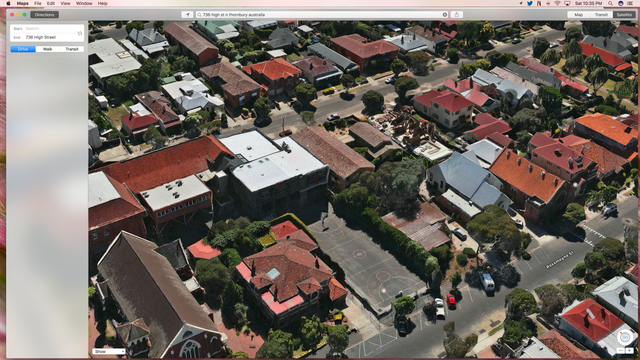 Across Mansfield St is the red brick school building. Note the change in colour of the roofing tiles. The brighter red roofing tiles denote the school extension which was not there in 1980. That area was open. The building on the far side of the school extension away from the viewer with the flat square roof was not there either. You can imagine someone running down the walkway, across Mansfield St, through the then open area and between the church on the right with the gabled slate roof and the presbytery with the hipped red tiled roof. The lower picture shows the same thing but looking northward rather than southward. The presbytery with its elaborate hipped roof is in the lower left corner and the back of the church is just visible next to it. This is a good view of the presbytery (marked 'Manse' on Allan Hircoe's hand drawn map) with the gap between it and the church clearly visible. Imagine the building to the immediate rear of the presbytery with the flat roof not being there and the school extension behind it likewise not being there. One can readily visualise someone running down the walkway (black line visible across Mansfield St) across Mansfield St and straight across open ground and then between the church and the presbytery. i think it would take less than 30 seconds to do that! Please feel free to leave your comments, questions or conclusions in the comments section below. Comments are subject to moderation. I will endeavour to answer any questions. Please allow for time zone differences. An "honourable mention in despatches" awaits those with correct answers! The answers are fairly straight forward though perhaps a little difficult to accept; it is more a case of 'The Emperor's New Clothes', sort of thing. There are no sleights-of-hand involved. I will give you good folks a few days to solve this 37 year old mystery that has made a mess of the lives of Maria's sons, Mark and Adam. After this I will lay out my solution and we'll see if we agree! "Cops try to cover their arses by not owning up to problem until 11th hour." "Cops try to cover their arses by hijacking the story at the 11th hour with their bungling 'limited hangout' story when the 2 priests are almost in the bag."